Fortnite has earned more than $50 million in revenue in under two months. The popular battle game managed to earn $1.5 million while it was still in beta and, after its official release, it took just one month to reach $25 million in revenue. Now, just two weeks later, the game has managed to double this number according to new data from Sensor Tower, surpassing $50 million in revenue. Despite the game being free to play, it capitalizes on the popular freemium model, allowing users to purchase in-game currency known as “V-Bucks” that can then be used to purchase various extras within the game such as outfits and gliders that are available for a limited time only. This has led in-game spending to average around $1 million per day according to the new data and there are currently no signs of it slowing down. Fornite developer Epic also keeps players entertained through different in-game seasons, which are accompanied by seasonal Battle Passes at a cost of 950 V-Bucks, or just under $10. These passes give players additional items that will help them complete the latest season and appear to be one of the biggest earners in the game. After all, the latest season launched earlier this week and in-game spending subsequently jumped 293-percent. Presently, the mobile version of Fortnite is only available on iOS devices, but the game’s developer has confirmed that an Android version is in the works, although no specific release date has been mentioned. 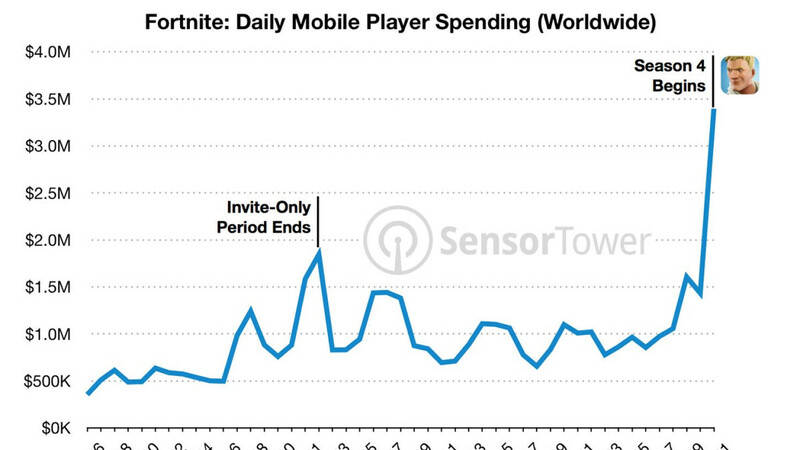 In any case, Sensor Tower expects the eventual release to push Fortnite’s mobile revenues past $500 million by the end of 2018. Great game but I can only play it on my PC and console. Not a game I would play on mobile.